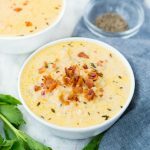 Healthy Cauliflower Soup with bacon is creamy, cheesy with chunks of Cauliflower in it. It is low carb and Keto. Start with browning the bacon. Set Instant Pot to Saute mode. When hot, add bacon pieces. Cook till they are brown and crispy. Add butter to the pan, followed by chopped onion. Saute onion until soften. Stir in minced garlic. Cook for another 30 seconds, until the raw smell is gone. Add Cauliflower florets. Fry it for a couple of minutes. When little brown spots start to appear, pour in the stock. Add bay leaf, thyme. Season it with salt and pepper. Set Instant Pot to the Manual Mode. Close the lid and let it cook on high for 5 minutes. Then let the pressure release naturally for 10 minutes, followed by quick release. When the pressure is completely released, carefully open the lid. Add cream, cheddar cheese and chilli flakes. Mix everything and smash a few cauliflower florets with the back of the spatula. Adjust seasoning. While serving sprinkle crisp bacon and more cheese if required. To make the soup on the stove top, take a heavy bottom soup pot. Cook bacon till crisp. Keep bacon aside. Add butter followed by onion and garlic. Saute till onion has softened and raw garlic smell is gone. Add cauliflower florets and stock. Cover and cook for 10-12 minutes until cauliflower is soft and tender. The rest of the steps are the same as the instant pot mentioned above.